1. Basic Principles of Internal Audit- Standard on Internal Audit (SIA) 2, Basic Principles Governing Internal Audit was, originally, issued by the Board in August, 2007 which was recommendatory in nature. The revised Basic Principles of Internal Audit is being issued as overarching document for all the Standards on Internal Audit, and shall become mandatory from such date as notified by the Council. Independence The Internal Auditor shall be free from any undue influences which force him to deviate from the truth. This independence shall be not only in mind, but also in appearance. Integrity and Objectivity The Internal Auditor shall be honest, truthful and be a person of high integrity. He shall avoid all conflicts of interest and not seek to derive any undue personal benefit or advantage from his position. Due Professional Care “Due professional care” signifies that the Internal Auditor exercises reasonable care in carrying out the work to ensure the achievement of planned objectives. Confidentiality He shall not disclose any such information to a party outside the internal audit function and any disclosure shall be on a “need to know basis”. Systems and Process Focus It requires a root cause analysis to be conducted on deviations to identify opportunities for system improvement or automation, to strengthen the process and prevent a repetition of such errors. Quality and Continuous Improvement The Internal Auditor shall ensure that a self-assessment mechanism is in place to monitor his own performance and also that of his subordinates and external experts on whom he is relying to complete some part of the audit work. 1. 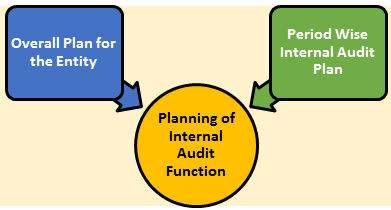 Planning-Define the overall plan, scope and methodology of the Internal Audit Function on a periodic basis. 3. Performance-Plan, acquire, engage and review the performance, training and development of professional staff, talent and other resources to achieve its objectives. 4. External Experts-Identify, source, engage and manage external experts and technical solutions, if required. 6. Improvement Programme-Develop and maintain a quality evaluation and improvement program. Alignment with the objectives of the Overall Internal Audit Scope, coverage and methodology of the audit procedures will form a sound basis for providing reasonable assurance. Allocate adequate time and resources Assign appropriate skills to complex areas and issues. As per the definition given in the standard, Internal Audit Evidence refers to all the information used by the Internal Auditor in arriving at the conclusion on which the auditor’s opinion is based. – establish that work performed is in conformance with the applicable pronouncements of the Institute of Chartered Accountants of India.